Well, you avoided being sniped at the last second on that gotta have eBay Erector set. The box arrives at your door a week later after completing the transaction through PayPal. You excitedly open the box and behold! A box full of rusty girders, paint falling off the baseplates and the inside label is shredded! What do you do? Instead of throwing away the lot, why not restore it? This tutorial will discuss painting and plating. Of course, removing the original paint and plating means the parts are no longer in "original" condition. But what the heck, if it makes them look better and if you sell the set, just mention that some of the parts have been restored. Is it worth your time and efforts to restore a set? 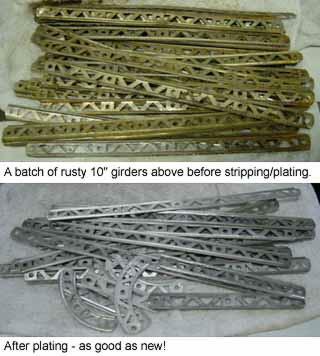 I cleaned and replated about 40 A, 40 B, 100 C, 40 D, 50 E, 20 BE/MO/DP girders in about 4 hours. The total cost of the parts in my example from Wagners is about $50. Painting runs about the same return on your time invested. It's a matter of where you want to spend your time. A restored 10½ set can go for over $500. Unrestored sets off eBay typically go for under $200. There are two shades of blue listed. The "Blue" paint is a close match to the blue erector boxes and MN/MD/MY baseplates from the 1930's and 1940's. Also listed is a "Dark blue" paint which is a match for some early 1950's sets I have with a distinctly darker blue, almost a purple colored MD/ME/MF plates. Rumor has it that A. C. Gilbert used to carry a bottle of red paint with him to check box colors. I have around (50) red boxed sets and have noticed at least three shades of red; so much for quality control. No one will notice a shade difference if you use the colors above. All of the paint (except the NAPA) is available from Wal-Mart. 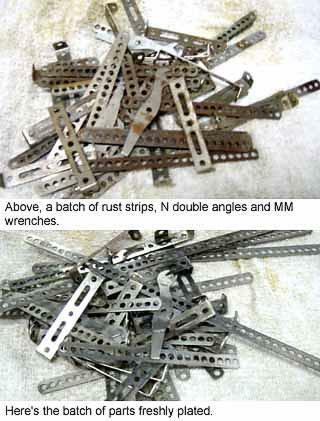 Gilbert did not prime his metal parts prior to painting. The first step is to completely remove the old paint. There are a number of methods depending on the amount to remove. For small jobs, use a wire brush or sandpaper. For large jobs, use a rotary paint stripper from an auto parts store. Another method is a chemical stripper. Personally, I prefer "Dad's Stripper"; you apply it with the included spray bottle and wash off with water. Follow the manufacturer's instructions for spraying the paint; mask off any brass hubs appropriately. I normally apply two coats and take care not to apply too heavy of a coat. Otherwise, you may get runs in the finish. By the way, Gilbert painted their parts by dipping. If you repaint a box, the labels inside and out are available in reproduction form. Pandys is the place to go for inner labels. They sell excellent 6 1/2 - 8 1/2 labels for $8, 10 1/2 for $20 and 12 1/2 for $50. The outer kneeling boy labels are available from either Pandys ($4) or Wagners ($6). Now, on to the plating. I used Caswell Plating (www.caswellplating.com) for my plating supplies. I have had good results with their "Plug 'n Plate" brass plating kit and their immersion tank for Nickel plating. I won't go into the theory of electroplating; Caswell's immersion tank comes with a very descriptive manual that if followed, gives excellent results. First, we'll discuss the Plug 'n Plate system. The brass kit costs $35 and comes with a transformer, application wand/sock and plating solution. The first step is to wrap the included cotton sock over the application wand and hold it in place with a rubber band. 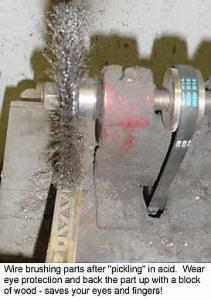 If the plating wand touches the surface of the item you are plating, the finish can become "burned". 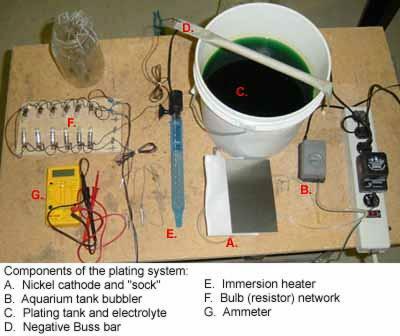 Plus, the sock is saturated with the plating solution thus eliminating the immersion tank. Pour some plating solution into a small container; the cap of the solution works great for this. If you dunk the wand directly into your solution bottle, it may become contaminated over time. Clip the negative lead of the transformer on the item to be plated. Soak the wand sock in solution and wipe over the item to be plated. Coverage is about 1 sq. inch per minute. I've used the brass setup to replate box latches, P7/P7A pulleys, CJ 36 tooth gears, BT pierced discs and P15 couplers all with good results. I am not able to get a bright brass finish, more like an antique brass finish. Now for the immersion Nickel electroplater. The basic one-gallon kit costs $95 and comes with a storage bucket/tank, tank heater, electrolyte, cleaning crystals, cathode and a 200+ page instruction manual. Don't worry, the manual covers other Caswell kits. They also sell larger kits and have kits available for plating with other metals. The distilled water is mixed with the electrolyte crystals to form the plating "soup" or electrolyte. The aquarium bubbler is used to agitate the tank while plating. I used a 6V-battery charger from an auto parts store for my power source. My unit happens to put out a maximum of 2.0 Amps at the low setting and has an ammeter on the front. The 6-volt bulbs and sockets are used to control the plating current. The sockets are wired in series to each other and the whole batch is wired in series in the plating circuit. The next part of the electrical system is to make a "buss bar". 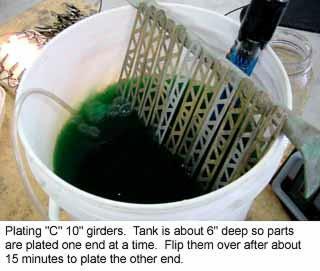 Use a short length of ½" copper tubing over the top of the tank for this. I pounded the ends flat and sanded the surface to make it a good conductor. The negative lead from the power source is attached to the copper tubing. Mine looks silver in the pictures because it was nickel plated to keep it from corroding. 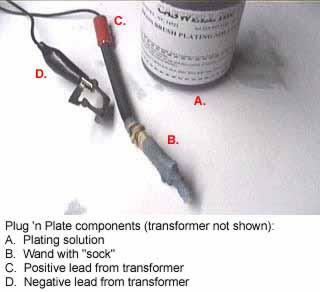 The positive lead is attached to the nickel cathode. A cotton sock is provided to cover the cathode to keep oxidation from getting into the plating solution. You can plate on top of existing plating. However, the object(s) to be plated should be clean before immersing. There are many ways to clean the parts. Lysol toilet bowl cleaner, Brasso and steel wool are some of the popular ones. In fact, after cleaning you may not decide to not plate the parts. 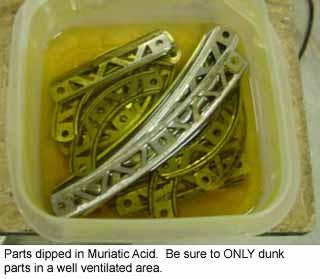 For deep cleaning/stripping, dunk the parts in straight Muriatic Acid. If using this method, make sure the area is well ventilated. Within a few minutes the old plating and rust will be removed. Any heavily rusted areas should be sanded down to bare metal. Tupperware containers work well for holding the parts. I made a "tank" out of a piece of 3" PVC with a cap at one end and a 45 deg. elbow at the other (for loading parts and dumping in/out the acid). Plating will not fill in deep pits from heavy rust. Surface preparation is one of the most important steps. A rough, dirty surface will not look like a mirror after plating. 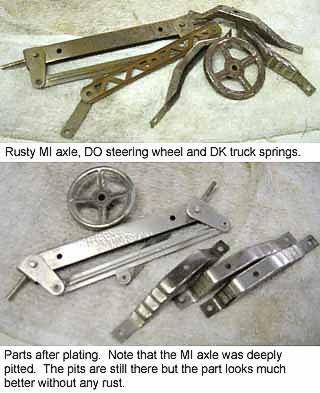 I used a wire wheel to clean the parts after acid "pickling" and degreased the parts with the supplied solution. Start by plugging in the immersion heater and place it in the tank. The recommended temperature is between 105-115 degrees F. The tank will take about an hour to heat from room temperature to the correct tank temperature. Next, estimate the surface area of the object(s) to be plated. Caswell recommends about 0.5 Amps per 10 square inches. Remember to count both sides of the part when figuring the surface area. 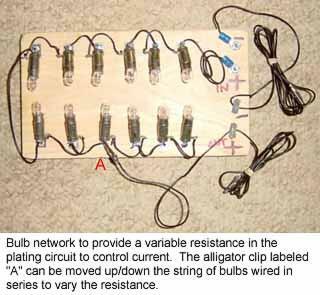 A bulb network (or variable resistor) can vary the current. The positive feed enters/exits the network. The exit pickup point can be adjusted to introduce up to (12) bulbs of resistance in the circuit of my setup. You can use 6V or 12V bulbs. Note that the 12V bulbs will only draw half of the current they are rated. 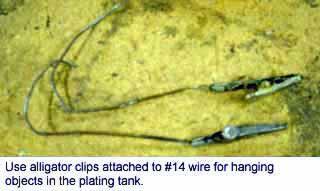 Use #14 wire to hang objects in the plating tank. 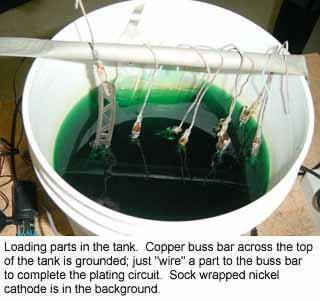 Loop the wire over the copper tubing and dunk the object. Cut a number of small holes in the aquarium bubbler tubing and thread a copper wire in it to weight it to the bottom of the tank. Once all of the parts are placed in the tank, turn on the power source. An ammeter can be used to check the plating circuit current, however, this is not a required step. 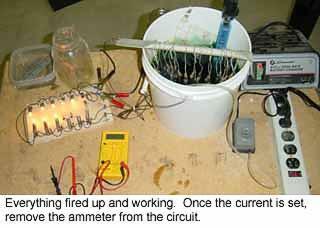 Start with all bulbs in the circuit and back them out one at a time until the circuit is drawing the proper current (assuming you're using an ammeter). The surface area of the object(s) you are plating determines the correct current. Too much current can burn the object. Too little current means longer plating time. Guidelines are clearly explained in the manual. The thickness of plating depends on a number of factors: current, amount of cathode in the plating solution, size of object being plated, and time in the tank. In general, most objects can be adequately plated in 15 minutes if all parameters are properly set. Also, you are not limited to using the supplied one gallon tank for plating. 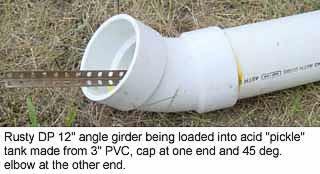 To plate an MB 18 1/2" angle girder, use a suitable sized plastic tank. Plastic kitchen organizers and wallpaper trays work well. I've plated EX, C and DP girders one end at a time by placing them in the tank and leaning them against the grounded copper tube. After 15 minutes, flip them over to do the other side. Generally, I do not buff the parts after plating. That operation will take the parts to a high sheen but is not required. Here are some befores and afters. If you plate a boiler, replacement labels are available from Joel Perlin ($3.75), Pandys ($1.00) and Wagners ($3.00). In conclusion, my success rate of spotless parts runs over 90%. Improperly cleaned parts are my typical downfall. Regardless, the non-mint parts still look much better than the rusty ones. Plus you get the satisfaction of saving a non-replaceable resource; girders and the like have not been produced for 40 years. Don't hesitate to contact me at BGHansen@voyager.net with any questions/comments.